Tank Farm Operations | Mitchell Scientific, Inc. 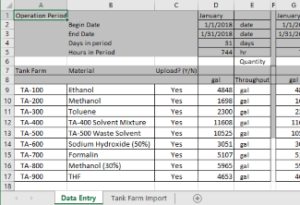 Processing tank farm monthly throughput data to calculate working and breathing losses in Emissions Accountant is very easy. 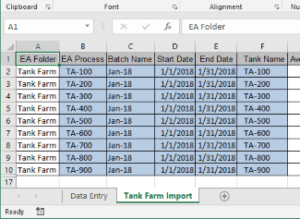 The user only needs to maintain the monthly throughput records in Excel that can be formatted to be read by Emissions Accountant. The left image shows the storage tanks, materials being stored, and monthly throughput quantities in gallons for the month of January. Throughput quantities for subsequent months may be entered into additional columns to the right. 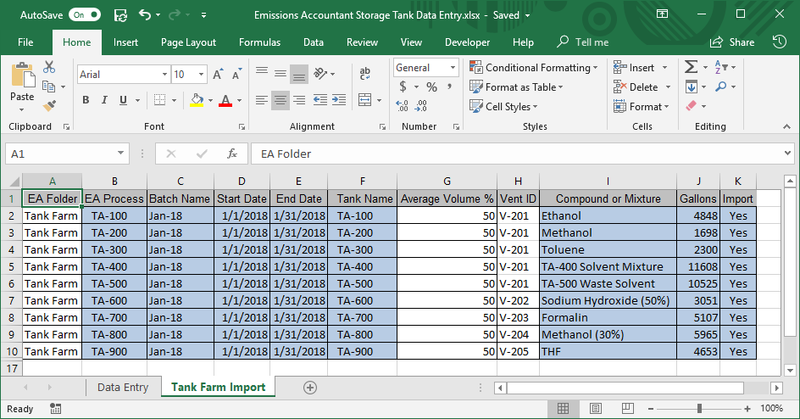 A link to download an example Excel Workbook that can revised as needed to accommodate a variety of tank farm operations tracking needs. Once the monthly tank farm records have been arranged in the necessary format then the data is ready for processing by Emissions Accountant. The immediately to the left illustrates how the monthly data is formatted.